Since 1944, FFG DMC has been delivering high quality, high productivity and high-performance machine tools. The range of machine tools include horizontal and vertical CNC lathes and vertical machining centres. To enhance their range of quality high precision products FFG DMC has announced five new and improved series of machines to strengthen the manufacturing industry for 2019. Focusing on one of the newest products is the impressive DVD-5200, twin spindle vertical machining centre, which is being exhibited at this year’s TIMTOS exhibition in Taiwan in February. The twin spindle vertical machining centre series includes models DVD-4300, DVD-5200 and DVD-9200, which are said to be the best in productivity and innovation due to their many benefits for manufacturing volumes of complex quality parts. Compared to other brands of twin spindle vertical machining centres there is a difference in what FFG DMC offers. 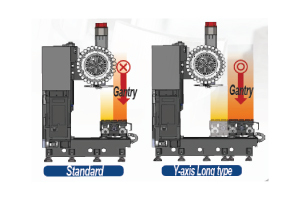 For example, the twin spindles work individually as well as simultaneously, also having an adjustment between the spindles meaning the position of parts or fixtures in the X-axis is not fixed and can be adjusted. Enabling machining flexibility with up to 500mm distance between the main axes on all models and simultaneous machining with two spindles halves the cycle times in production. The are many options available if there are specific requirements for certain complex parts, one of these options includes being able to extend the Y-axis allowing more space in the loading area which is perfect for an automation line, as you can see in the example diagram below. These series of machines offer manufacturers 40% space saving, compared to previous models, freeing up more floor area. 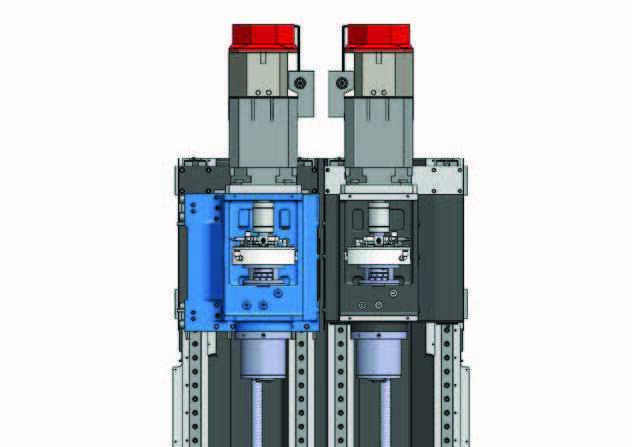 The advantage of having twin spindle heads on one machine provides manufacturers with a quality investment in their plant, rather than using just one spindle head, thus reducing the need for a higher quantity of machinery. 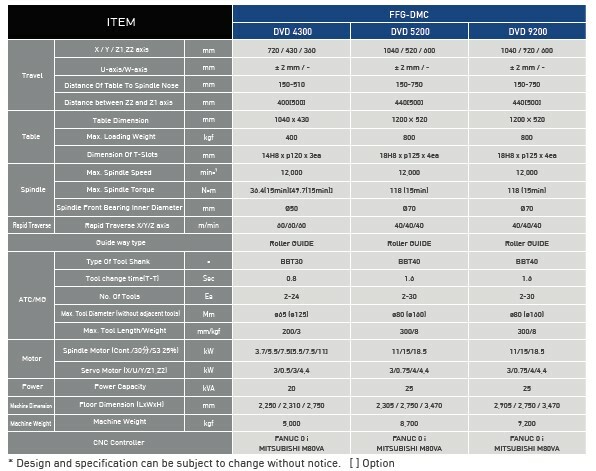 The image below shoes the specifications on offer in the twin spindle range by FFG DMC. Furthermore, four more models have been annouced for launch through the rest of this year. They include the DL-2400, DL-2500SY, DL-4500XL(M) and DL-4500LSY. More details are to follow in the next few months. For more information on the FFG DMC range visit our Products page or to stay up-to-date on the latest products follow us on Twitter, LinkedIn and Facebook.